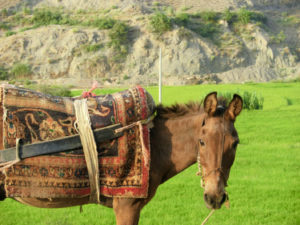 Traveling over the ancient Silk Route by bicycle shows you this wonderful world we live in, full of beauty, charm and adventures. Iran is definitely part of this wonderful world! Full of history and friendly people! 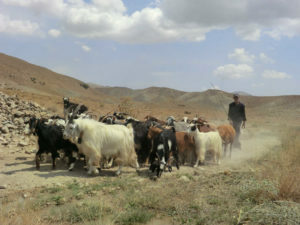 The Silk Route took us through the cities of Quchan, Bojnurd, Shahrud, Semnan, Theran, Zanjan and Tabriz with many small villages in between. Plenty of time to meet the people of Iran! Meeting local people is easy and the first interesting discussion I had, was actually next to our camp site on the second day. Due to the end of the Ramadan and the 16th summit of the Non Aligned Movement (countries) in Tehran, most Iranians were enjoying a long weekend or short holiday. 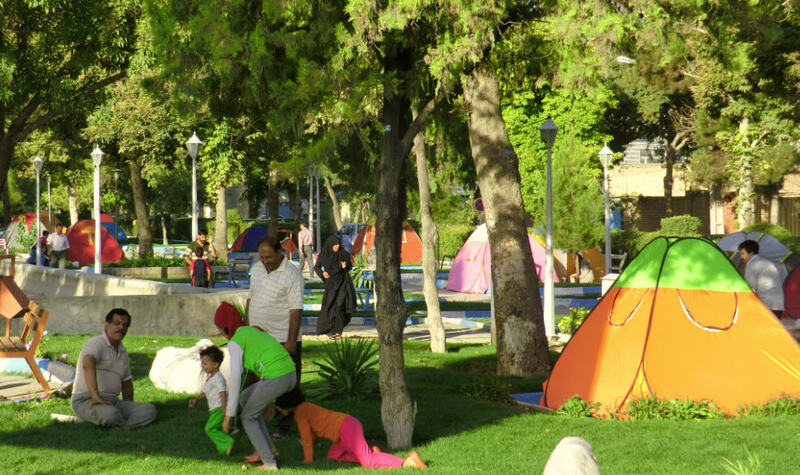 And Iranians love to camp when they have holidays, something which totally surprised me! They camp preferable in parks or next to a mosque, spent their evening on a carpet while eating and drinking, and sleep outside of in a typical Iranian tent! I have seen camp sites with hundreds of people, with kids playing and men smoking water pipes. But all is needed for an interesting discussion is a cup of tea! With more than 50% of Iranians less than 35 years old, most of them speak English pretty well. And as I am from The Netherlands, I don’t mind asking people about their government, religion or view on the world. Most Iranians don’t hesitate to express discontent about the lack of freedom in their country. Women have to wear a chador but most women don’t want to. Officially almost 100% of the Iranians are muslin, but there are just a few people going to a mosque. Partying, like going out to a bar or discotheque is also not possible in this country. The same is true for alcohol. So people find ways around that. Truck drivers smuggle alcoholic beer into the country; which tastes much better that the non-alcoholic fruit beer which is available in most mini markets. Iranian pop music is actually pretty good; one of our support vehicle drivers is enjoying loud music at lunch or in camp! In the discussions I have with Iranians, it is obvious that somewhere in the next couple of years a rebellion against the regime will happen. As one Iranian man says: “a wind of change will blow through Iran within a few years”. Many people I spoke are also saddened by the imagine that Iran, and thus Iranians, have abroad. 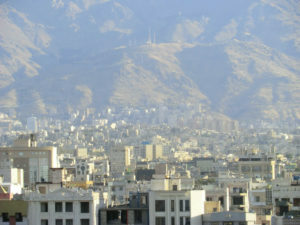 But the people of Iran are one of the friendliest and hospitable I met in Asia! You can notice the friendliness in many simple things. For example: riding in the mountains, a car stops and offers me some orange juice. In a way I can’t refuse! Or a real Heineken (5% alcohol, and Ingrid is my witness)! 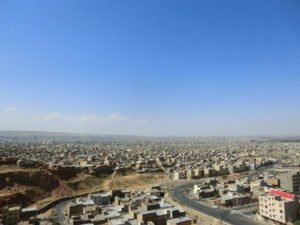 I was walking through the streets of Tabriz when a man walks towards me and asks me where I am from. Before I can say anything he continuous speaking and says he’s happy I am visiting his city and country and hope I enjoy may stay here! 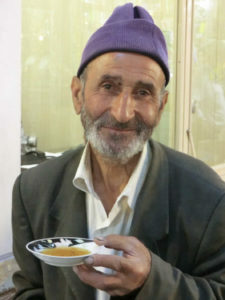 Hospitality is part of Iranians culture. T’aarof is a kind of ritual where the host is obliged to offer a guest anything, and the guest is equally obliged to refuse it. But I can tell you that’s difficult! 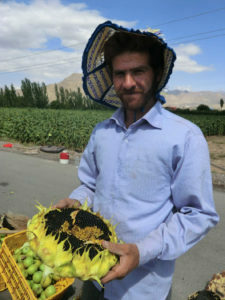 I met this guy next to the highway selling sun flower pits. I had a nice chat with him, and he gave me two sunflowers. I refused kindly but he insisted and put them on top of my back rack. When I saw an Iranian pay 20.000 Reals for two, I insisted to pay him the same. He refused. I wanted to push the money into his hands, he pulled back. There was simply no way not to accept these sunflowers! He must have a simple life with not much money, but he shared what he had with a stranger, a guest. When is the last time you have seen someone doing that in the west? There are much more similarities between Iran and the west than I thought there would be. 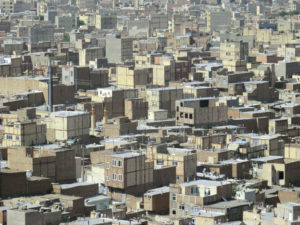 The cities in Iran are full of life: commercial streets and shopping centers are offering western style clothing and other luxury items, lots of traffic and traffic jams, fast food restaurants serving Coca Cola or Fanta, there is a difference between rich and poor when looking at expensive jewelry, BMW’s and houses in Tehran, there are high speed cameras on the highways, people love their children and family and most of all they want to enjoy life. But there are also differences: public busses or subways have special areas for women, women have to cover their head with a scarf of chador although some show more hair than others and everywhere in the country you see pictures or the two Supreme Leaders Rouhollah Khomeini and Ali Khamenei. In many cities and villages you see also billboards showing pictures of the martyrs of the Iran-Iraq war, which made somewhere around 750.000 Iranian deaths. Also, in many roads in cities and villages you’ll find many boxes for collecting donations, apparently for one of the five ‘pillars’ of Islam. 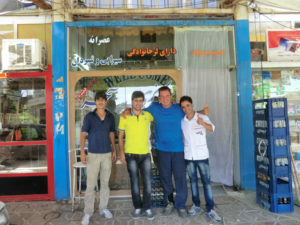 Iran has an ancient culture and our local support guide Ali has done a great job in showing us as much as possible. Camp sites were always special; a.o. we camped next to a mosque, an abandoned mine or inside a caravanserai. He gave us some insights in the country’s history and geographical location. In Tehran he organized a visit to the Golestan Palace. In Tabriz we went to the Azerbaijan museum, the Blue Mosque and a local festival where one of us was interviewed for the Iranian television. 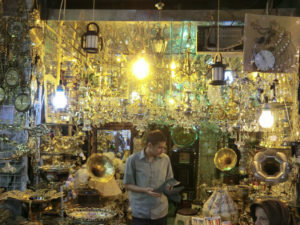 The bazaars in Tehran and Tabriz were impressive: many small shops for kilometers and kilometers in small alleys! I bought a real Gucci bag for Mariëlla! And also a Channel and a Louis Vuitton bag! 😉 Ali was able to persuade the tour leader to adjust the route (no highway!) so we’re able to visit the Qara Church, which is listed in the UNESCO World Heritage list! Iran has been a great experience! Such a difference from what I read in the newspaper! 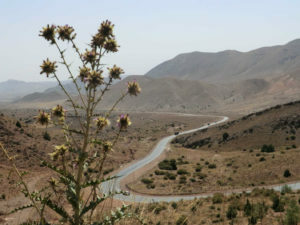 There is much more to see and explore in Iran! And certainly on a bicycle!